Out now, The Green Lantern #1—the first time Morrison has written a monthly superhero comic in half a decade, pairing him with Wonder Woman Rebirth’s Sharp, as well as Steve Oliff and Tom Orzechowski, on art duties—finds Hal in a strange place, aimless and wandering on Earth, flitting from job to job. 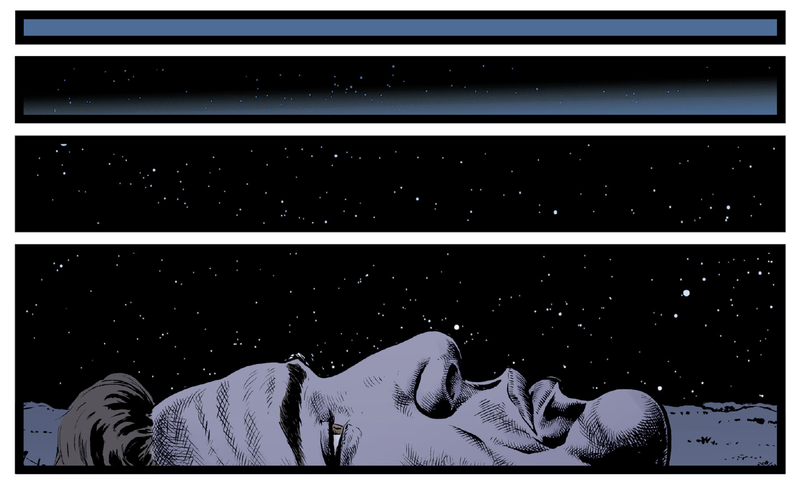 At night, he gazes up to where he’d really rather be: among the stars of the DC universe. 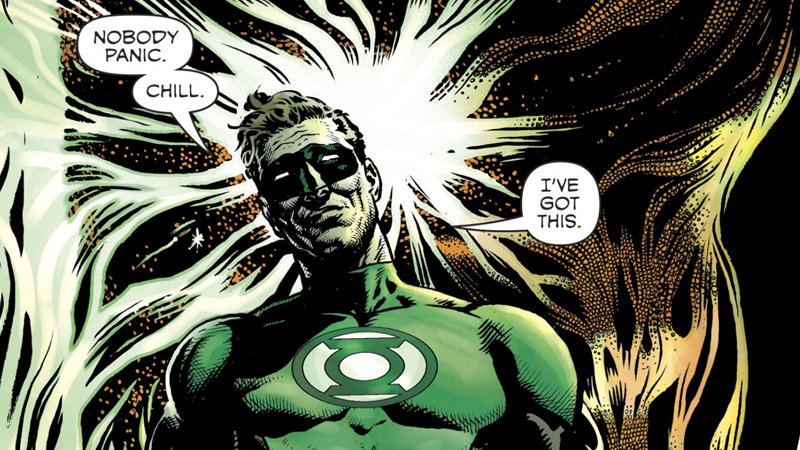 Matters quickly bring Hal into said stars by the end of the issue, but it turns out that during his time back on Earth, things among the Lanterns in space have gotten more weird and more wonderful than ever. A bit more terrible, too; after all, a good space cop needs some things to fight. This renewed alien weirdness forms a fundamental shift in the direction Morrison and Sharp want to take Hal’s new ongoing series—a book that balances the humdrum banality of life on Earth with the wild, impossible adventures (and yet in someways, similarly banal) the Green Lantern Corps experience on the job. To learn more about just what it means to be an intergalactic lawman for Hal Jordan, and what we can expect from The Green Lantern, we spoke to Morrison and Sharp. Check out our full interview below. The Green Lantern is the first project you’ve worked together on as a creative team. What’s that process been like, meeting over Hal as a character and then getting to work on this series? Grant Morrison: It started more as—Liam and I have known each other for awhile and we wanted to do something. And the last couple of years, we kept bumping into one another at events. So, we think, “What are we going to do? What are we going to do next?” and then suddenly Dan DiDio came up with this Green Lantern thing, which he spoke to me about and then spoke to Liam about, independently. And as soon as the idea was doing it together was noted, then it seemed that was the inevitable collaboration we were working towards. Liam Sharp: It’s weird how things worked out. I’ve said it’s like it was one of those “meant to be” moments...there was a gravity to it. What drew you both to Green Lantern as a character, and working with the cosmic side of DC for this series? Morrison: Well, the cosmic stuff, I always loved that stuff. I grew up reading Marvel cosmic as a kid, and the weirder DC I liked as well. So that was an easy sell. And it was also, the last long run I did was Batman, which was very much set in black, dark alleys, and off of roofs. So the idea of having access to the entire universe and all kinds of possibilities and aliens and landscapes and planets was intoxicating, you know? In terms of how it was to Hal Jordan as Green Lantern, it was the assignment, honestly. This was one where Dan came to me, he said, “do you want to do this?” I said, “no,” then I had ideas for 12 issues within 20 minutes, so I had to acquiesce to the fact that yeah, maybe I would like to do it. And the kind of ordinariness that a lot of people see in Hal Jordan—the “white bread” nature, as we sometimes say—it became part of the fun! How do you vitalise that character? And it’s not even needed, Geoff Johns did a great job, lots of people have done great stuff with Hal Jordan, but, to rein him back a little bit and to say, “here’s what makes this interesting...” was part of the equation. Part of the fun. Sharp: Yeah, well, first off—as Grant said—we’ve been talking about doing something, so having something solid there...I’d obviously just come off of Wonder Woman and Brave and the Bold, and it being DC and a long-running project with Grant was like a no-brainer. Just an immediate “yes” from me. But the other thing was, you know, all the Wonder Woman-related stuff was very much in the fantasy zone. And I just didn’t want to cast myself as a fantasy guy. I’ve always loved science fiction, and fantasy as well, anything that’s got an element of world-building to make your imagination fly a bit and be creative and try and see things in fresh ways, you know? These kinds of stories really afford a chance to really play around. Breaking the rules of Earth-bound stories doesn’t apply at all, you know? You can really try to challenge yourself to come up with new ways of looking at things. Whether it’s down to how you disguise a character or how the scale of things are going to be affected, or time’s going to be affected. Anything grabs you. Gravity, or the lack of gravity? What’s it like [when] you’ve got a murder of a gas giant that takes centuries? You can deal with those kind of things. It was just really exciting. We started talking about all kinds of crazy things. It put me off my limits, it’s been great. One of the things that was teased when this book was being announced was this idea of exploring different concepts of what justice can mean in the wider scope of the galaxy. Can you speak more about the role of that theme, and how it’s playing into the series? There’s been a lot of—putting it mildly—really weird stuff going on in the DC cosmic right now, while all the Green Lanterns have been on the periphery of that. Is that something that will be addressed in this series—what it is the Guardians actually police and manage out in space? Morrison: Yeah, I mean, hopefully we’ll turn it, and accommodate everyone else in the DC Universe as best we can as well...so we look like, for instance, Scott Snyder set up a set to the Multiverse that we address. Probably, if anything, Scott tamed it. But yeah, we do go there and we kind of deal with the idea of the Fourth Wall being broken, which is very bizarre. So we try to accommodate those things in our own way. But mostly, the idea is to just tell stories anyone can read without knowing what’s going on in the wider context. The connections are there, but every issue of Green Lantern should be its own little thing, you know? That’s what we’re trying to do, so people can just pick it up and understand it from the get-go. You’ve mentioned you’re pulling Green Lantern, as a character, back to the more classical, stripped-down sort of approach. Liam, is that something that’s going to come through in the aesthetic of the book? What influences were you looking at when you trying to nail down the feel of this? Sharp: Yeah, definitely. It is something Grant and I talked about. Because you’ve got—in the beginning, it’s almost this 2000 AD aesthetic where you’re on the gambling planet, and it’s all aliens and it’s all spaceships and it’s all big and weird. But then when we come to Earth, we get this caravan, kind of rambling...very American vibe. And I was definitely doing a sort of throwback even down to the Cadillac that drives past in the scene. I thought, “I’ll make it vintage.” It’s meant to be now, so I’m not trying to make—I had to sort of throw in tattoos and things that would tell you it was not the 50s. But I still wanted to create a very Americana vibe for those scenes. I wanted them to be unmistakably passive America. But also to hark back to a kind of storytelling we don’t really get that often, anymore. Or see in comics. These mainstream comics. You know, like Grant was recently saying, there’s been a lot of PTSD in comics where people are so destroyed to their core, it drives everything that they do. And Hal’s seen and done everything, he’s a more incredible guy but he’s also bored shitless [laughs], and longs for the stars and bigger adventures. Sharp: So yeah, we tried to catch that. I was going to ask, what’s Hal’s headspace like as he’s coming into the start of this series? We’ve got John Stewart dealing with the Justice League, and Hal’s now out here on his own doing his space cop thing. Where do we find his as a character, emotionally and internally, as we’re coming into the book? Morrison: Well, it starts off and he’s obviously back in New Mexico with Eve Doremus, a character from past Green Lantern series. And we see him lying there, he just stares at the sky and he’s thinking, and Liam drew it in profile with him in the mountains, it’s like he’s rooted, but he’s on the Earth. He just can’t even stop. So we wanted to contrast that with the Green Lantern in flight, you know, the Hal that’s not air bound? So it’s like—we don’t want a traumatised guy who’s working through issues, at all. He’s had this long history where he’s been dead, alive, he’s been the Spectre, he’s destroyed the world, he’s come back, he’s been evil, he’s been good—so we kind of think, to be honest and deal with that guy’s psychology, we ought not go to the usual places. This is a very unusual astronaut-type. He’s gone beyond and seen things we can’t even imagine. He comes back to this planet and it’s like, it’s ridiculous. And all our problems and decisions seem ridiculous to him. But he still has a nostalgic, sentimental attachment to the place. So, he’s that guy. But he has...he always throws himself into danger. He doesn’t see. He has no connections in the sense that give him any fear for his own mortality. His own safety, or danger. He’ll just throw himself into things. To explore that as someone—you know, I’m not that. I’ve got to say. But to get into the headspace of someone whose not like us and to take him to where we are, “Yeah, well, he’s this damaged ex-pilot.” No, he’s not. He’s weirder than that. He’s stranger. He’s a superhero cop. What head is that? That’s something science fiction. Sharp: There’s a fun bit in issue three, where he admonishes the entire Earth and treats them like children. And he’s not wrong. 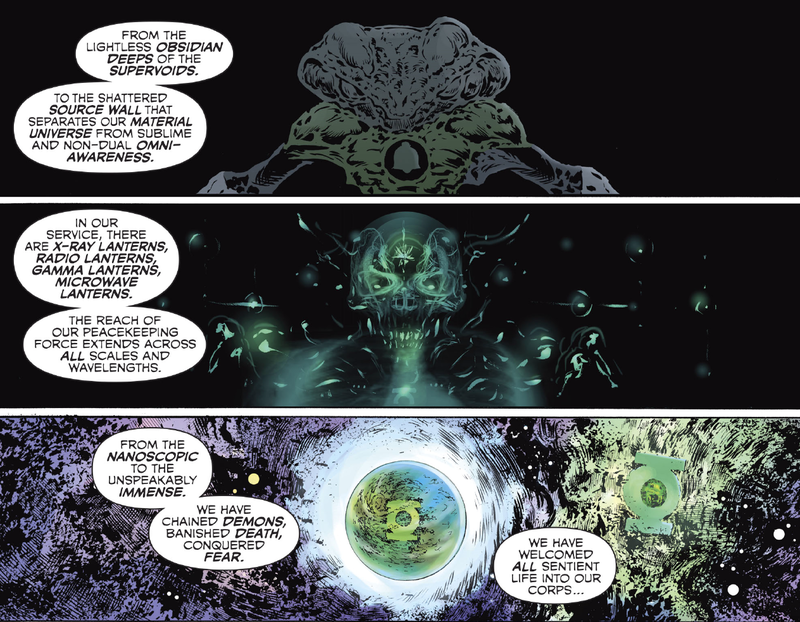 Recent runs of Green Lantern have been on an epic, cosmic level that’s always constantly being ramped up. 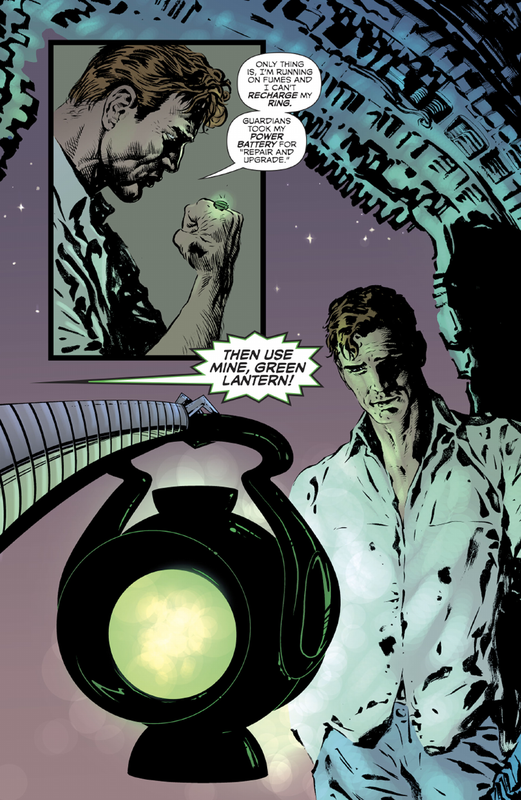 We’ve explored the origins of Lantern rings and all these interstellar conflicts. What do you hope fans who are sort of accustomed to these big scale epics take from this weird, more intimate look at Hal? Morrison: Well, I think just the fact that it feels a little bit different. What I hope people take from it is that you can tell slightly more low-key adventures. I think it becomes an arms race that’s unwinnable to continue to keep topping everyone’s world-ending scenario. It can be fun, but I think we’ve all done it for so long now that it becomes yet another trope. So the idea was to just take it back to the everyday. And you don’t have to worry about the end of the universe, you just have to worry about telling a decent story. You know, having some good characters and things that get raised and then resolved. And little subplots. It seems to make it easier, and I think it also makes it more universal, storytelling-wise, when it’s not about gigantic crises. It’s about stories we understand but are not necessarily on an epic scale. Sharp: They’re much smaller and bigger at the same time. Smaller in a sense that they’re dealing with massive things on a small canvas. Events that might be connected up. But as you’re looking at it individually, issue to issue, you’re not there. There are things that end up being addressed in that moment. At the same time, we’re taking a journey. You’ve got the universe as your garden to play in. And we’re playing in that universe rather than just keeping our nose down. We’ve got this kind of cosmic potential to be out in the cosmos, that makes it highly entertaining. I also love that there are these kind of universal tropes all the way through the universe, like, a hospital ship— whether it’s run by aliens or not, it’s always going to have a red cross on the side of it. And the real reason’s just become a universal kind of thing, you know? And there’s certain behaviours, and certain iconic images--they’ll still be playing cards on other planets. It’s fun stuff that, for whatever reason, has somehow become adopted across the universe. So there’s always something familiar, no matter how weird everything gets. The Green Lantern #1 is in stores now.